if it lacks pretty pictures. a small miracle happened within mossy shed yesterday. to entertain us whilst we wait out the rain. which i think is terribly wonderful of him at such short notice. noooooooooo not sir cliff, i for one am happy to wait in the rain in silence if that's alright? maybe even twiddle my thumbs for entertainment... forth and back, yes definitely no need for sir cliff for me. Err, rain may have stopped play (happens in Cricket too, don'tcha know),but your stitches are perfeck, and your iron was obviously hot. Carry on and don't panic, hehehe. I am so pleased to hear about your miracle! Of course there was no doubt at all that you would be able to achieve one! Just in that little snippet I can see beautiul finishing! I cannot wait to see your newly born dress!! Mr P looked over my shoulder as I opened this post. 'Is that some pants?' he asked. Pants or not I am excited to see the results of the latest Tif/Ethel collaboration. 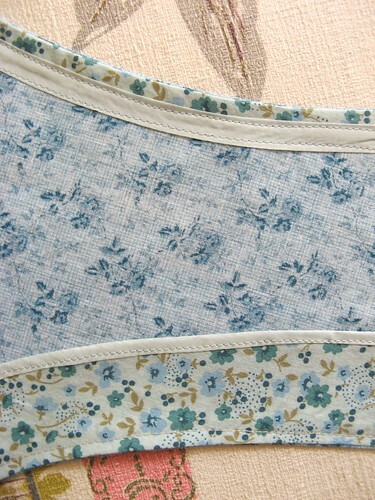 What a teasy little snippet of a picture of your new dress, I await with breath a baited for the full reveal. also, congratulations on your dress making abilities and the wonderful feeling that comes along with accomplishing something of the nature. Oh lordy please no, I am happy to wait for high-hopes-dress-posts in silence rather than have Sir Richard of Cliff abusing my ears! Other than that, fine posting meh deah. I can't wait to see! The edges are lovely, I'll tell you that much. I luv the dress~ i just stumbled upon your blog and I'm happy I found it!